A commander-in-chief is the person or body that exercises supreme operational command and control of a nation's military forces or significant elements of those forces. In the latter case, the force element is those forces within a particular region, or associated by function. As a practical term; it refers to military competencies that reside in a nation-state's executive leadership—either a head of state, a head of government, a minister of defence, a national cabinet, or some other collegial body. Often, a given country's commander-in-chief (if held by an official) need not be or have been a commissioned officer or even a veteran. This follows the principle of civilian control of the military. The role of commander-in-chief derives from the Latin, imperator. Imperatores of the Roman Republic and Roman Empire possessed imperium (command) powers. In its modern use, the term first applied to King Charles I of England in 1639. 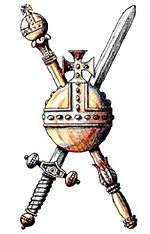 It continued to be used during the English Civil War. A nation's head of state (monarchical or republican) usually holds the nominal position of commander-in-chief, even if effective executive power is held by a separate head of government. In a parliamentary system, the executive branch is ultimately dependent upon the will of the legislature; although the legislature does not issue orders directly to the armed forces and therefore does not control the military in any operational sense. Governors-general and colonial governors are also often appointed commander-in-chief of the military forces within their territory. According to the Constitution of Albania, The President of the Republic of Albania is the Commander-in-chief of Albanian Armed Forces. The incumbent Commander-in-chief is President Bujar Nishani. The Constitution (German: Bundes-Verfassungsgesetz) states, in Article 80, that the President is the Commander-in-Chief of the Federal Armed Forces. However, it further provides that the President may only have the Federal Armed Forces at his disposal to the extent provided in the Defence Act (German: Wehrgesetz); and that the supreme command over the Federal Armed Forces is exercised by the federal minister authorized to serve in this capacity by the Federal Government, i.e. the cabinet under the chairmanship of the Federal Chancellor, as defined in Article 69. The powers of command-in-chief over the Canadian Forces are vested in the Canadian monarch, and are delegated to the Governor General of Canada, who also uses the title Commander-in-Chief. In this capacity, the governor general is entitled to the uniform of a general/flag officer, with the crest of the office and special cuff braid serving as rank insignia. By constitutional convention, the Crown's prerogative powers over the armed forces and constitutional powers as commander-in-chief are exercised on the advice of the prime minister and the rest of Cabinet, the governing ministry that commands the confidence of the House of Commons. According to the National Defence Act, the Minister of National Defence is responsible and accountable to parliament for all matters related to national defence and the Canadian Forces. In theory, the governor general could also use his or her powers as commander-in-chief to stop any attempts to use the Canadian Forces unconstitutionally, though this has never occurred and would likely be highly controversial. Article 93 of the Constitution of the People's Republic of China states the authority to direct the Armed Forces of the People's Republic of China is vested with the Central Military Commission; composed of a Chairman, and numerous Vice-Chairmen and members. The same article also states that the Chairman of the Central Military Commission assumes overall responsibility for the work of the Central Military Commission, and that it is responsible to the National People's Congress and the Standing Committee. In Egypt, the President of the Republic holds the ceremonial title of Supreme Commander of the Armed Forces. A member of the government, usually defence minister, is commander-in-chief of the Egyptian Armed Forces, the incumbent being Sedki Sobhi. The president still remains the only individual capable of declaring war. Until the election of Mohamed Morsi in June 2012, prior Egyptian presidents had all been former military officers, and during the Yom Kippur War the president played a major role at all levels of the planning of the war, and was in a literal sense Supreme Commander of the Armed Forces giving direct orders to the commanders from the headquarters during the war as field marshal of the army, colonel general of the air force and air defence forces and admiral of the navy. Anwar Sadat often wore his military uniform, while former president Hosni Mubarak had abandoned this tradition. According to Article 10 of the Constitution of Indonesia, the President of the Republic of Indonesia holds the supreme command of the Indonesian Armed Forces. Day-to-day operations of the Armed Forces is handled by the commander of the Indonesian Armed Forces (Indonesian: Panglima TNI) (4-rank officer, can be General (Army), Admiral (Navy) or Marshall (Air Force). Indonesian Armed Forces has three service branch: Indonesian Army, Indonesian Navy (including Indonesian Marine Corps), and Indonesian Air Forces. Each service branch headed by Chief of Staff (4-rank officer) who have task to develop soldier professionalism in each branch. But commanding authority is held by Commander of Indonesian National Armed Forces. Commander have direct commanding authority to Main Combatants Command (Indonesian: Komando Utama Tempur) from all service branch such as Army Special Forces Command, Army Strategic Reserve Command, Military Area Command, Fleet Command, Military Sea Traffic Command, National Air Defense Command & Air-Force Operational Command. Commander of the Armed Forces is appointed by President from active Chief of Staff (Army, Navy, or Air Force) and must get approval from House of Representative. Chief of Staff is also appointed by President from senior military officer. President as Commander in Chief also have authority in senior military officer mutation and promotion in tour of duty. Minister of Defense have responsibility to assist President in defense issues and create policies about authorization use of military force, manage defense budget, etc. For authorization use of military forces or declaration of war, President must get approval from House of Representative. Commander of Armed Forces is giving recommendation to Minister of Defense in creating national defense policies. In the Islamic Republic of Pakistan, before the 1973 Constitution, the head of the Army, i.e., the Chief of the Army Staff, was referred as Commander-in-Chief. The term was replaced by Army Chief per recommendation of the Hamoodur Rehman Commission's report. The report also recommended that the president, being the head of state, be referred to as Supreme Commander. (The role of President is only a ceremonial position since the real power rests with the elected prime minister, who is the chief executive of the state.) Since 1973 these roles have been changed. Mostly the Presidents of the Federation held the real power since most of the Presidents (especially Dictators and Army Rulers) have played a more significant role, But Presently the Main Authority again rests with PM after the strengthening of democracy. During the Fourth Republic, the 1973 Constitution introduced by Ferdinand Marcos created a semi-presidential system that split the Executive into two, with the prime minister retaining the office of commander-in-chief and the president reduced to a figurehead. The wording of Article VII, Section 10 in the previous constitution enabled Marcos as commander-in-chief to declare Martial Law and suspend the writ of habeas corpus on 21 September 1972. Marcos also issued an edict, conferring the rank of five-star general in the military to the President, as Commander-in-Chief of the Armed Forces. He consequently sat as both president and prime minister until 1981, when Cesar Virata succeeded him to the latter office. Salvador Laurel was the country's last prime minister when the office was abolished after the 1986 People Power Revolution, and the position's powers (including military authority) were again merged with the Presidency. 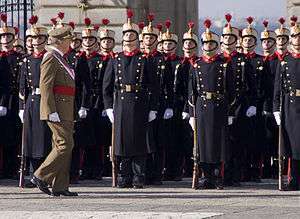 The President of the Portuguese Republic is the constitutional Supreme Commander (in Portuguese: Comandante Supremo) of the Armed Forces of Portugal. However, the operational command is delegated in the Chief of the General Staff of the Armed Forces. 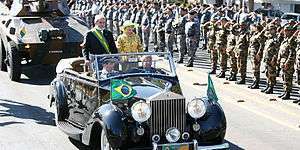 In the Portuguese military parlance, the term "Commander-in-Chief" (in Portuguese: comandante-em-chefe or simply comandante-chefe) refers to the unified military commander of all the land, naval, air and space forces in a theater of operations. The British monarch is the "Head of the Armed Forces" and their commander-in-chief. Long-standing constitutional convention, however, has vested de facto executive authority, by the exercise of Royal Prerogative powers, in the prime minister and the Secretary of State for Defence. The Prime Minister (acting with the support of the Cabinet) makes the key decisions on the use of the armed forces. 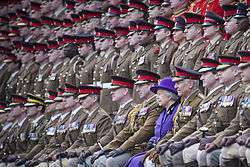 The Queen, however, remains the "ultimate authority" of the military, with officers and personnel swearing allegiance only to the monarch. A new constitutional convention appears to have become enshrined since the 2003 war in Iraq, whereby the UK will only take military action (other than in circumstances of having to immediately react defensively) with the consent of the House of Commons. The Chief of the Defence Staff is the professional head of the Armed Forces and is an appointment that can be held by an Admiral, General or Air Chief Marshal (four-star officers). Before the practice was discontinued in the 1990s, those who were appointed to the position of CDS (professional head of the Armed Forces) had been elevated to the most senior rank in their respective service (a five-star officer). The CDS, along with the Permanent Under Secretary, are the principal advisers to the departmental minister. The three services have their own respective professional chiefs (likewise four-star officers): the First Sea Lord who is also Chief of Naval Staff, the Chief of the General Staff and the Chief of the Air Staff. From 1660 until 1904 the professional head of the Army was known as the Commander-in-Chief and as such had significant independence and power. Since 2012, however, full operational command has been vested in the three Chiefs of Staff, and the appointment of distinct Commanders-in-Chief has been discontinued. This change was implemented in response to the 2011 Levene report, which advised that it would serve to "streamline top-level decision-making, simplify lines of accountability..., remove duplication between the posts and also provide impetus to the leaning of the senior leadership". New three-star appointments (Fleet Commander, Commander Land Forces) mirror the old ones, but these are subordinate officers with delegated command responsibility, rather than Commanders-in-Chief. 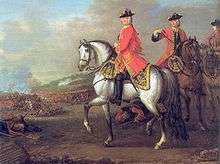 King George II at the Battle of Dettingen in 1743, by John Wootton. 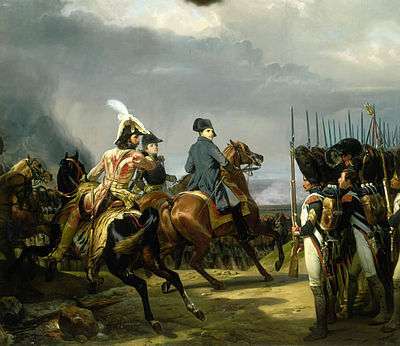 It remains the last time a British monarch personally led his troops into battle. 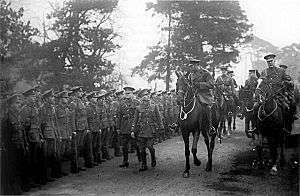 King George V inspecting the British 29th Division prior to the division's departure for Gallipoli in 1915. The division commander, Major General Aylmer Hunter-Weston, rides alongside the King at the right of the photo. Queen Elizabeth II posing for a photograph with soldiers from the Household Cavalry, at Combermere Barracks in 2012. A warning sign posted "By Command of the Defence Council". According to Article II, Section 2, Clause I of the Constitution, the President of the United States is commander in chief of the United States Armed Forces. U.S. ranks have their roots in British military traditions, with the President possessing ultimate authority, but no rank, maintaining a civilian status. 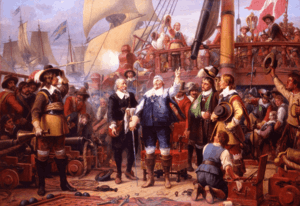 As with European monarchies, the position of the American president as the nominal head of the armed forces is deeply rooted in traditions going back centuries. The amount of military detail handled personally by the President in wartime has varied dramatically. George Washington, the first U.S. president, firmly established military subordination under civilian authority. 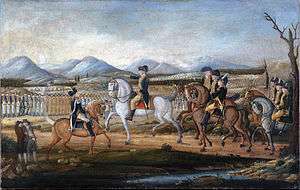 In 1794, Washington used his constitutional powers to assemble 12,000 militia to quell the Whiskey Rebellion—a conflict in western Pennsylvania involving armed farmers and distillers who refused to pay excise tax on spirits. According to historian Joseph Ellis, this was the "first and only time a sitting American president led troops in the field." However, James Madison briefly took control of artillery units in defense of Washington D.C. during the War of 1812. Abraham Lincoln was deeply involved in overall strategy and in day-to-day operations during the American Civil War, 1861–1865; historians have given Lincoln high praise for his strategic sense and his ability to select and encourage commanders such as Ulysses S. Grant. On the other extreme, Woodrow Wilson paid very little attention to operational military details of World War I and had very little contact with the War Department or with General John J. Pershing, who had a high degree of autonomy as commander of the armies in France. As President in World War II, Franklin D. Roosevelt worked closely with his generals, and admirals, and assigned Admiral William D. Leahy as Chief of Staff to the Commander in Chief. Harry S. Truman believed in a high amount of civilian leadership of the military, making many tactical and policy decisions based on the recommendations of his advisors—including the decision to use atomic weapons on Japan, to commit American forces in the Korean War, and to terminate Douglas MacArthur from his command. Lyndon B. Johnson kept a very tight personal control of operations during the Vietnam War, which some historians have sharply criticized. 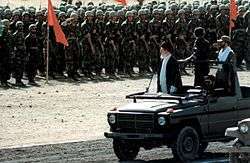 In 1990, the Iraqi invasion of Kuwait and the ensuing Gulf War in 1991, saw George H.W. Bush assemble and lead one of the largest military coalitions of nations in modern times. Confronting a major constitutional issue of murky legislation that left the wars in Korea and Vietnam without official declarations of war, Congress quickly authorized sweeping war-making powers for Bush. The leadership of George W. Bush during the War in Afghanistan and Iraq War achieved mixed results. In the aftermath of the September 11 attacks by al-Qaeda, the subsequent War on Terror that followed, and the 2003 invasion of Iraq due to Iraq's sponsorship of terrorism and alleged possession of weapons of mass destruction, the speed at which the Taliban and Ba'ath Party governments in both Kabul and Baghdad were toppled by an overwhelming superiority of American and allied forces defied the predictions of many military experts. However, insufficient post-war planning and strategy by Bush and his advisors to rebuild those nations were costly. Before 1947, the President was the only common superior of the Army (under the Secretary of War) and the Navy and Marine Corps (under the Secretary of the Navy). The National Security Act of 1947, and the 1949 amendments to the same act, created the Department of Defense and the services (Army, Navy, Marine Corps and Air Force) became subject to the "authority, direction and control" of the Secretary of Defense; the civilian cabinet-level official serving as the head of the Department of Defense and who is appointed by the President with the advice and consent of the Senate. The Goldwater-Nichols Act in 1986 codified the default operational chain of command: running from the President to the Secretary of Defense, and from the Secretary of Defense to the combatant commander. 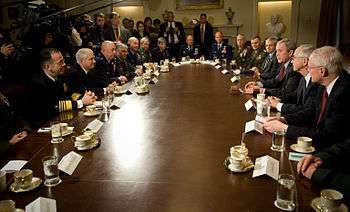 While the Chairman of the Joint Chiefs of Staff outranks all other military officers, he does not have operational command authority over the Armed Forces. However, the chairman does assist the President and the Secretary of Defense in the exercise of their command functions. During the 20th century, certain area commanders came to be called "Commander-in-chief". As of 2011, there are nine combatant commanders: six have regional responsibilities, and three have functional responsibilities. Before 2002, the combatant commanders were referred to in daily use as "Commanders-in-chief" (for instance: "Commander in chief, U.S. Central Command"), even though the offices were in fact already designated as "combatant commander" in the law specifying the positions. On 24 October 2002, Secretary of Defense Donald H. Rumsfeld announced his decision that the use of "Commander-in-chief" would thereafter be reserved for the President only. 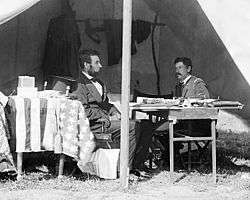 President Abraham Lincoln and Major General George B. McClellan in a military tent after the Battle of Antietam, 1862. 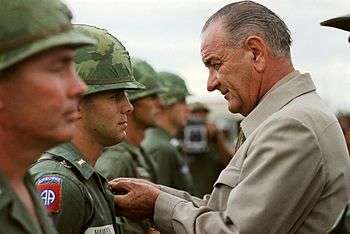 President Lyndon B. Johnson awards the Distinguished Service Cross to First Lieutenant Marty A. Hammer in Vietnam, 1966. The Football is a briefcase, carried by an aide-de-camp, which gives the President the ability to access the Gold Codes and to launch a nuclear attack while away from a fixed command center. Admiral Mike Mullen and Secretary of Defense Robert M. Gates attend a meeting of combatant commanders with President George W. Bush in the Cabinet Room at the White House, 2008. 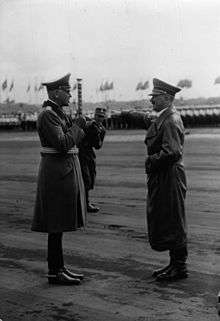 In peacetime, under Article 65a, the Federal Minister of Defence (German: Bundesminister der Verteidigung) holds the supreme command authority (German: Inhaber der Befehls- und Kommandogewalt - IBuK) over the German Armed Forces. If the Bundestag declares the state of defence (German: Verteidigungsfall), the Federal Chancellor, under Article 115b, assumes the command authority over the armed forces. As of 2016, this has never happened. The rationale for placing the command authority over the armed forces directly with the responsible minister in charge of the military establishment, and thus breaking with the longstanding German constitutional tradition in both earlier monarchical and republican systems of placing it with the head of state, was that in a democratic parliamentary system the command authority should directly reside where it would be exercised and where it is subject to the parliamentary control of the Bundestag at all times. By assigning it directly to the responsible minister, instead of with the Federal Chancellor, this also meant that military affairs is but one of the many integrated responsibilities of the government; in stark contrast of earlier times when the separate division of the military establishment from the civil administration allowed the former to act as a state within a state (in contrast to the Federal Republic, the Weimar Republic began with the Ebert–Groener pact, which kept the military establishment as an autonomous force outside the control of politics; the 1925 election of Paul von Hindenburg as Reichpräsident, surrounded by his camarilla, did little to reverse the trend). In Japan, prior to the Meiji Restoration the role of the commander-in-chief was vested in the Shogun (The most militarily powerful Samurai daimyo). After the dissolution of the Tokugawa Shogunate the role of the commander-in-chief, resided with the Emperor of Japan. The present-day constitutional role of the Emperor is that of a ceremonial figurehead without any military role. After Japan's move towards democracy, the position of Commander-in-Chief of the Japanese Self-Defence Forces is held by the Prime Minister of Japan. Military authority runs from the Prime Minister to the cabinet-level Minister of Defense of the Japanese Ministry of Defense. Supreme authority over the military belongs to the Federal Council, which is the Swiss collegial head of state. Nothwithstanding the previous sentence, under the Constitution, the Federal Council can only, in the operational sense, command a maximum of 4,000 soldiers, with a time limit of three weeks of mobilisation. For it to field more service personnel, the Federal Assembly must elect a General (see below) who is given four stars. Thus, the General is elected by the Federal Assembly to give him the same democratic legitimacy as the Federal Council. In a time of declared war or national emergency, however, the Federal Assembly, assembled as the United Federal Assembly, specifically for the purpose of taking on the war-time responsibilities elect a General as Commander-in-Chief of the Armed Forces under Article 168 of the Constitution. While The General acts as the highest military authority with a high degree of autonomy, he is still subordinate to the Federal Council (See Articles 58, 60, 174, 177, 180 & 185). The Federal Assembly retains the sole power to dismiss the General, but the General remains subordinate to the Federal Council by the Council's ability to demobilise and hence making the position of General redundant. 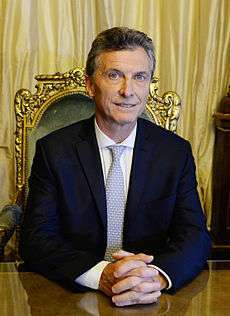 ↑ "CONSTITUTION OF THE ARGENTINE NATION". Argentine Senate. Retrieved 2014-01-21. ↑ "Ministerio de Defensa" (in Spanish). Retrieved 2014-01-21. ↑ "The Constitution as in force on 1 June 2003 together with proclamation declaring the establishment of the Commonwealth, letters patent relating to the Office of Governor-General, Statute of Westminster Adoption Act 1942, Australia Act 1986.". ComLaw. Retrieved 2014-01-21. ↑ "Defence Act 1903". ComLaw. Retrieved 2014-01-21. 1 2 "Constitution". Government of the People's Republic of China. Retrieved 2014-01-21. ↑ "Constitution of the CR of December 16, 1992.". President of the Czech Republic. Retrieved 2014-01-21. ↑ "Ministry of Defence of the Czech Republic". Ministry of Defence. Retrieved 2014-01-21. ↑ "Professional Army". Ministry of Defence. Retrieved 2014-01-21. ↑ "Constitution Act" (PDF). Folketing. Retrieved 2014-01-10. ↑ "My Constitution Act with Explanations 2013" (PDF). Folketing. Archived from the original (PDF) on 3 November 2013. Retrieved 2014-01-10. ↑ "LOV nr 122 af 27/02/2001 om forsvarets formål, opgaver og organisation m.v." (in Danish). Retrieved 2014-01-10. ↑ "Facts and Figures" (PDF). Danish Defence. Retrieved 2014-01-10. ↑ "Constitucion de la República Dominicana" (in Spanish). World Intellectual Property Organisation. Retrieved 2014-01-21. 1 2 Constitution of 4 October 1958, National Assembly of France. Retrieved on 2013-05-13. ↑ "GAF and Police pledge full commitment to their new C-in-C". Gaf.mil.gh. Ghana Armed Forces. 26 July 2012. Retrieved 2014-05-08. ↑ "Continue to position Ghana and GAF high globally, -C-in-C". Gaf.mil.gh. Ghana Armed Forces. 15 August 2012. Retrieved 2014-05-08. ↑ "Official President.ie site - Roles of the President". Áras an Uachtaráin. Retrieved 23 December 2014. ↑ "Statute Book - Defence Act, 1954". Retrieved 1 May 2015. Under the direction of the President, and subject to the provisions of this Act, the military command of, and all executive and administrative powers in relation to, the Defence Forces, including the power to delegate command and authority, shall be exercisable by the Government and, subject to such exceptions and limitations as the Government may from time to time determine, through and by the Minister. ↑ "The Constitution". National Assembly of Mauritius. Retrieved 2015-06-30. ↑ "THE 1987 CONSTITUTION OF THE REPUBLIC OF THE PHILIPPINES – ARTICLE VII". Official Gazette. Retrieved 2014-01-21. ↑ Mikhail Tsypkin (September 2004). 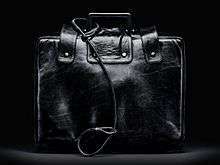 "Adventures of the "Nuclear Briefcase"". Strategic Insights. 3 (9). Archived from the original on 2004-09-23. ↑ "The Constitution of the Russian Federation". Presidential Administration of Russia. Retrieved 2014-01-10. ↑ "Commander-in-Chief of the Armed Forces". Presidential Administration of Russia. Retrieved 2014-02-10. ↑ "President of Serbia". Presidential Administration of Serbia. Retrieved 2016-09-06. 1 2 3 Constitution of Spain 1978, Government of Spain. Retrieved on 2014-01-09. ↑ Queen and Armed Forces, royal.gov.uk. Archived 13 April 2015 at the Wayback Machine. ↑ "Whose hand is on the button?". BBC. 2 December 2008. Retrieved 2009-03-14. ↑ "An independent report into the structure and management of the Ministry of Defence" (PDF). ↑ The Awesome Power: Harry S. Truman as Commander in Chief. LSU Press. pp. 265–269. ↑ "The Presidency of George H.W. Bush". University of North Carolina School of Education. ↑ Accessing the George W. Bush Presidency. Edinburgh University Press. p. 261. ↑ Presidential Decisions for War. JHU Press. ↑ "CINC" Is Sunk, American Forces Press Service, 25 October 2002. Retrieved on 2016-05-04. ↑ Governor is commander in chief -- Adjutant general is executive officer., Constitution of the Commonwealth of Kentucky. ↑ California Constitution - The Executive., Constitution of the Commonwealth of Kentucky. ↑ "Constitution of Ethiopia" (PDF). House of Federation. Retrieved 2014-01-21. 1 2 Basic Law for the Federal Republic of Germany, Bundestag (Print version. As at: October 2010). Retrieved on 2013-08-21. ↑ "Self Defense Forces". Encyclopedia of Japan. Tokyo: Shogakukan. 2012. OCLC 56431036. Archived from the original on 25 August 2007. Retrieved 2012-07-15. ↑ The Ministry of Defense Reorganized: For the Support of Peace and Security (PDF). Tokyo: Japan Ministry of Defense. 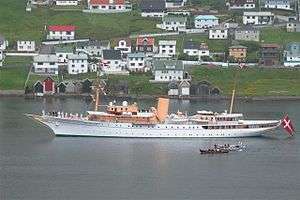 2007. pp. 4–5. ↑ "職種　Branches of Service" (in Japanese). Tokyo: Japan Ground Self-Defense Force. 2012. Retrieved 15 July 2012. ↑ 自衛隊: 組織 [JSDF: Organization]. Nihon Daihyakka Zensho (Nipponika) (in Japanese). Tokyo: Shogakukan. 2012. OCLC 153301537. Archived from the original on 25 August 2007. Retrieved 2012-07-15. ↑ "The Constitution of the Kingdom of the Netherlands 2008" (PDF). Government of the Netherlands. Retrieved 2014-02-10. 1 2 3 Besselink, Leonard F.M. (2011). The Legal And Constitutional Position of the Netherlands Armed Forces and International Military Cooperation (PDF) (Technical report). Universiteit Utrecht. ↑ "Organisation chart". Ministry of Defence. Retrieved 2014-02-10. ↑ "DPRK Constitution (Preamble)". naenara.com.kp. Retrieved 2014-02-20. ↑ "DPRK Constitution (Chapter VI State Organs, Section 4. The Presidium of the Supreme People's Assembly)". naenara.com.kp. Retrieved 2014-02-20. 1 2 3 "DPRK Constitution (Chapter VI State Organs, Section 2. The Chairman of the DPRK National Defence Commission)". naenara.com.kp. Retrieved 2014-02-20. 1 2 "DPRK Constitution (Chapter VI State Organs, Section 1. The Supreme People's Assembly )". naenara.com.kp. Retrieved 2014-02-20. ↑ "DPRK's Kim Jong Un elected first chairman of National Defense Commission". People's Daily Online. 14 April 2012. Retrieved 21 March 2013. ↑ "Regeringsformen 1809 med ändringar 1809-1974" (in Swedish). Studieförbundet Näringsliv och Samhälle. Archived from the original on 31 August 2010. Retrieved 2014-02-10. ↑ "The Instrument of Government" (PDF). The Riksdag. Retrieved 2014-02-10. ↑ About the Armed Forces, Swedish Armed Forces . Retrieved on 2013-05-12. 1 2 3 4 Haltiner, Karl W. (2002). "The Swiss Security Sector: Structure, Control, Reforms" (PDF). Geneva Centre for the Democratic Control of Armed Forces.